Two male bandits suspected to have been seriously injured during a robbery at Alliance, Canal # 2 Polder, West Bank Demerara are currently being sought by police whilst the driver of a car reportedly used to transport the perpetrators, is being interrogated, the Guyana Police Force said in a statement. 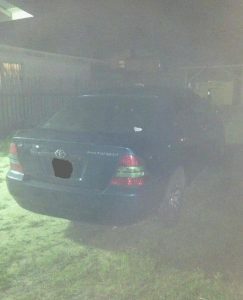 “The vehicle which after a “brief pursuit” by the police was intercepted at Leonora, WCD is impounded; a suspected blood-stained jersey as well as traces of blood were found inside the blue NZE Toyota,” the law enforcement agency said. 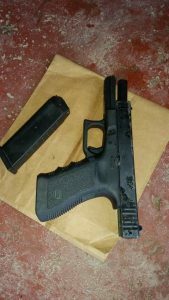 Police added that two live 9mm rounds were found at the scene and an unlicensed 9MM pistol, allegedly taken from one of the two armed suspects during a struggle, has been handed over to the police. Investigators were told that about 2 O’clock Tuesday morning, a 31-year old mechanic/businessman was sleeping in a hammock under a shed in his yard when he was confronted by two men armed with handguns who demanded valuables; they then took him inside of his house which was left open and relieved him of a large sum of cash, in the presence of a sibling. “During the ordeal, the suspects gun-butted the victims who retaliated and engaged them (bandits) in a physical confrontation and during which process, the victims reportedly managed to disarm one of the gunmen after the magazine fell out of the other’s gun. The victims then quickly armed themselves with instruments and wounded the suspects who fled in the waiting vehicle which they (victims) pursued but were forced to retreat after they were reportedly fired upon,” police said.